I'm not entirely sure where I first heard of Christopher Edge's Penelope Tredwell books but when I was making my RIP list, I remembered them and decided to get the first two books from the library. 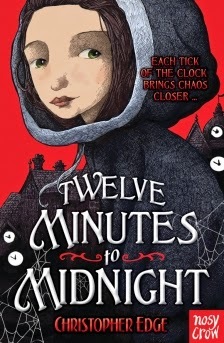 Twelve Minutes to Midnight introduces us to Penelope Tredwell, a young orphan who has inherited the running of a literary magazine, the Penny Dreadful, from her father. 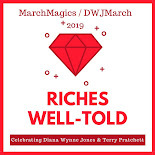 What was once a barely successful business has become an immensely popular publication due to the macabre stories written by Montgomery Flinch -- who is secretly Penelope herself. However, in the Victorian society she lives in, it would never be acceptable for a girl to be the author of these stories so she has created the Flinch persona, even going as far as hiring an actor to portray the author in public. When the Penny Dreadful and Flinch are contacted by the head of the Bedlam Asylum and asked to help solve a mystery, Penelope is the one secretly tasked with unmasking the villain. 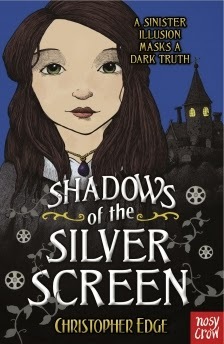 In Shadows of the Silver Screen, Penelope has the chance to see one of Montgomery Flinch's (her) stories, The Daughter of Darkness, brought to life by a man who claims to have created the first motion picture camera to capture both color and sound. But what this camera actually captures is what Penelope must find out -- before it's too late. I read these two books with just one other in between. I was excited to embark on another adventure with Penelope Tredwell so soon because these stories are truly terrifying. I thought they would be typical middle grade fantasy mysteries but they're really horror stories. Penelope's life is seriously in jeopardy more than once and the villains are terrible people, but not in a cartoony, Count Olaf sort of way. Luckily, Penelope is a strong character who is able to defeat these villains and the writing is such that you really feel her angst at being marginalized and ignored. I found myself rooting for her to get her due, even when I knew it wasn't likely. 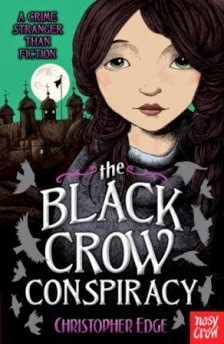 The third book in the series, The Black Crow Conspiracy, has recently come out and I'm just waiting for my library system to get it (presumably after it is released in the U.S.). I love the premise behind these! I don't normally gravitate toward scary stories, but your RIP reviews are convincing me otherwise. I know! The US covers have slightly less detail than these but are almost identical. I like that she's getting slightly older on each cover too! They sound like great fun! I love the covers and the premise--they sound wonderful. Must track down the first one in the set and give it a go. Penelope sounds a tad like Louisa May Alcott who wrote thrillers for money and was very good at it. I hope you do pick them up. I'll be anxiously waiting for the third to be published in the US! These sound great! I don't really do much horror, but these sound JUST scary enough. Are these graphic novels or just have covers that look it? They sound fascinating and great for RIP! I'll have to see if my library has them. They're not graphic novels but have beautiful covers! The covers are almost identical to their original UK ones from Nosy Crow. I think they always have a great sense of design. I loved the first one in this series - and now that you've reminded me that they exist, I just requested the second one from my library. I can't really handle a lot of true, adult horror, but these are perfect. I love the covers of these books, I've just ordered a second hand copy of the first one from amazon for just 1p plus postage - I'm sure second hand books aren't part of my book buying ban!